We can help. Our meeting management software called Meeting Administrator is now available in a free beta version. Create reports of meeting action items such as actions overdue, due by person, due by date etc. Think of a meeting as three levels of information. The generic information. The meeting name, venue, date and time and invitees. The meeting items. What are the topics to be discussed in the meeting, who is responsible and how long should each item be allocated. After the meeting has been held, was the item resolved, and what was decided. Generic Information is captured in the three top tabs - Main Details, People and Notes. 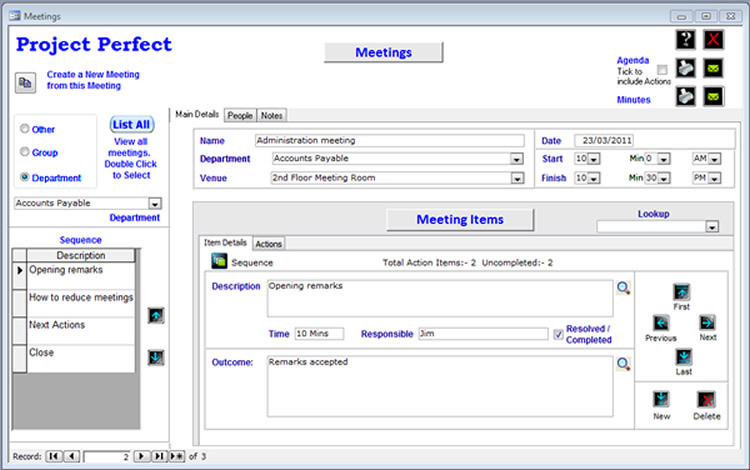 Meeting Items are captured in the bottom half of the screen. You can see the buttons to navigate through the items on the right, and the sequence of agenda items on the left. Meeting Actions are recorded for each meeting item on the tab for the item. You can see the action tab under "Meeting Item". You can also see there are two action items for this meeting item. Both are uncompleted.